The grass guides are a one-stop-shop for everything you need to know about your lawn. With so many different types of grass out there its impossible to provide generic lawn care advice. That’s why we’ve developed the grass guides. These guides provide extremely detailed information about each type of grass which can be found throughout the United States, how to take care of that type of grass, and what it takes to have the greenest lawn in the neighborhood. Different types of grass grow in two different types of climate. These are generally classified as warm season and cool season types of grass. We’ll discuss the different types of grass that grow really well in each of these areas. It should also be mentioned that there are a few different types of grass that can survive in both areas. 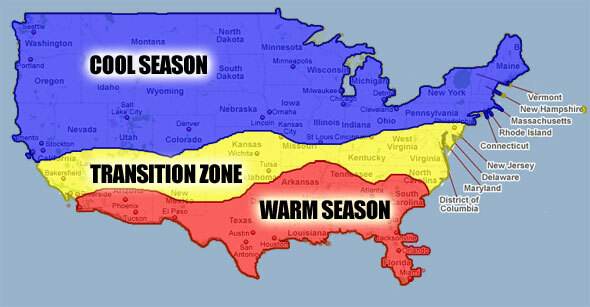 There is an area of the country called the transitional zone where warm and cool season grasses can both be found growing. Cool season grasses include the Rye and Fescue varieties as well as Bentgrasses. These types of grass are well suited to the north of an imaginary line from central Virginia across the country to southern California, although there is a fairly broad transition area on either side of that line where either warm of cool season grasses may thrive. Cool season grasses are commonly established through the use of seed whereas the warmer season grasses are more often established through the use of plugs or sod. Air temperature, soil temperature, moisture and soil type are the major determinants for the type of grass that can be successfully cultivated in a particular region of the country. The cool season grasses experience optimum growth when soil temperatures are between 50° and 65°F and air temperatures are between 60° and 75°F. One can easily see that these air and soil temperature ranges exist in most of the United States so one has to examine the local grasses that are thriving in a particular region to judge what might be best for their purposes. Areas affected often by drought might do well to pick a warmer season grass and if drought is not a problem then a cooler season grass might be more appropriate. Tall Fescue Grass – This is probably the most beautiful type of grass out there. If it dense enough it can provide a good weed and disease resistant lawn. It needs plenty of water to remain dark green, but makes for a stunning lawn year round. Rye Grass – Rye grass comes in Annual and Perennial. Both are cool season grasses and are well adapted to sunny conditions and moderate temperatures. Annual rye grass is mostly used to overseen warm season grasses to provide fall and winter color. Bentgrass – This grass type is primarily used on golf course putting greens. Bentgrass is generally not found in the majority of lawns as is extremely expensive to maintain. Bentgrass prefers full sun but is tolerant of some shade. Kentucky Bluegrass – This type of grass grows best during the fall, winter, and spring months as do most cool season grass. Kentucky bluegrass prefers full sun but can tolerate some shade throughout the day. The warm season grasses include Bermuda, Zoysia, and Buffalo grasses. These grass types grow best in the southern portion of the United Stats, but there is a fairly wide transition line exists that is impacted by a number of local climatic conditions. Warmer season grass types experience browning periods when they become dormant due to cool temperatures whereas cool season grasses will maintain their green color throughout the year. The warmer season grasses experience their best growing periods when soil temperatures are between 70° and 90°F and air temperatures are between 80° and 95 °F. Since the warmer season grasses may experience browning when exposed to cool temperatures that may be a fact that influences a decision on the type of grass to grow. For those that wish to maintain a green lawn throughout the year, an alternative is to plant annual rye during the dormant periods of the warm season grasses. Annual Rye seeds and grows relatively easily and will gradually disappear as the temperatures begin to rise and the warms season grasses begin to spring to life. Before selecting a grass for any particular area it is important to evaluate the characteristics for each seasonal grass and compare that to the climate in the region where it will be grown. As with all things in life there are advantages and disadvantages for each grass type. Bermuda Grass – Bermuda grass can survive the harshest of summers and is therefore extremely drought resistant. This grass spreads easily and is a perennial grass which means you won’t need to reseed every year. Zoysia Grass – Zoysia forms one of the thickest turfs you’ll ever see. Once its well established it is nearly impossible for weeds to penetrate which is a major benefit of zoysia lawns. Another major benefits is that it doesn’t grow quickly so that means a lot less time mowing the grass. St Augustine Grass – Florida and Texas are the most common areas of the country to find St. Augustine grass. This type of grass flourishes in sunny and humid conditions. It forms a very thick turf which is a pleasure to walk on when watered properly. Bahai Grass – This grass type is also quite popular in Florida and southern California, but unlike St Augustine it is much more resistant to drought. Aside from being drought resistant it is also very resistant to bugs and diseases. Buffalo Grass – Buffalo grass probably the only grass that is native to the United States. It grows extremely well in the Great Plains and is also drought resistant. This grass spreads very easily which helps form a great lawn in no time at all. Carpet – Carpetgrass is a creeping type of grass that loves wet soil conditions. Carpet grass is planted from seeds or sprigs and is native to the interior Gulf states. 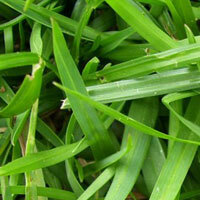 Centipede – Centipede grass produces a very nice looking lawn that is virtually weed free and very dense. This makes centipede lawns very attractive. While centipede grass is slow growing it’s very aggressive which gives it the aforementioned characteristics.